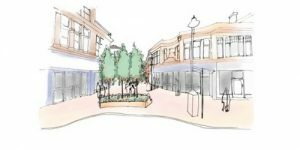 The Council is moving ahead with plans to make Taunton town centre more user friendly, improving the area for pedestrians and cyclists in line with its status as the first Garden Town in the South West. Phase one covering the permanent closure of St James Street between North Street and Lower Middle Street will begin in the New Year. It will be followed by phase two which will see an 18-month trial closure of Hammet Street and East Street to all vehicles except buses and cyclists. A further dedicated consultation will be held for East Street, where the local community can put thoughts forward about the proposed designs. If the trial is successful, the permanent changes to both East Street and Hammet Street will follow as quickly as possible. The public space project will generate opportunities for businesses, event organisers and artists to explore creative uses of the town’s most attractive areas. It forms part of a much wider plan to enhance Taunton’s appeal along with the regeneration of Coal Orchard and Firepool. Cllr Richard Parrish, Executive member for Planning Policy and Transportation, said: “Taunton becoming a Garden Town gave us a real opportunity to review our town centre and look at how we can create a better environment for residents, shoppers and visitors, which will help attract investment and allow businesses to thrive. The Traffic Regulation Order and commencement of the statutory consultation period relating to the closure of St James Street will be published on 22 November. This website contains background information on the project, and an FAQ section relating to the proposed works, and the wider context of town centre improvements that TDBC are committed to in the near future.